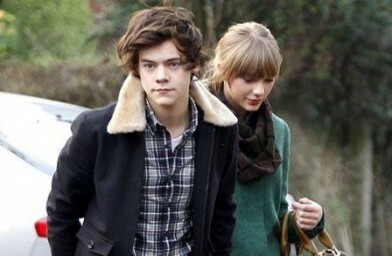 Harry Styles has told friends he doesn’t care if Taylor Swift writes songs about about him even though his ex girlfriend is notorious for writing songs about her failed relationships. A source told Hollywood Life: “Harry doesn’t care that songs are being written about him! If they are about him, he is in no rush to hear them. He’s moved on. The only thing related to Taylor and him is that his band mates are joking with him that he is the next victim of her songs! The former couple are set to come face to face at the BRIT Awards later this month after managing to narrowly avoid each other at the NRJ Awards in Cannes, France in January. Harry, 19, will be performing his new Comic Relief single ‘One Way Or Another’ alongside his One Direction band mates, who are up for Best British Group. Taylor has also confirmed she will be attending the BRIT’s and is in talks to perform, where she is nominated for best International Female Solo Artist at London’s O2 Arena on February 20.